A son of a Lutheran minister at Wittenberg University, David Elder was slated to go to seminary, but instead turned out to be a sculptor. Upon completion of a Masters degree at Ohio State University, he had the opportunity to stay on as an apprentice to a classically trained sculptor in residence. “I learned more about the skills of making sculpture from old man Erwin F. Fry than I did in any classroom,” states David. While at Ohio State he also learned the art of bronze casting. Arriving on the West Coast he proceeded to set up art foundries at California State Long Beach, Pasadena City College, and California State Los Angeles. At Northridge the foundry was already in place, but he developed it into one of the most active fine art university foundries in southern California. As a professional sculptor he started out in welded steel and later moved into working with Polyester Resin. He considers himself part of the “Finish Fetish School” of sculptors in the 60s. “Those of us working in that stuff tried to make it look like the hand of man had never touch it,” he remarked. 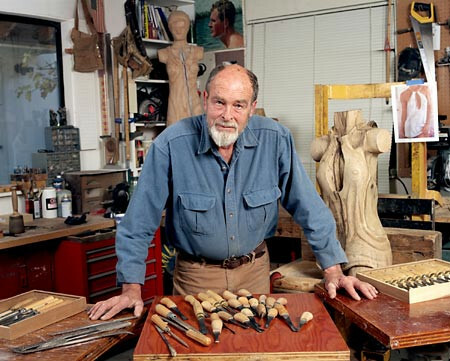 After his wife Linda and he built their home and studio in Ventura, he began to work in wood. He made contacts with several tree trimmers in town and they have kept him supplied with a source of logs. “I will carve any piece of wood that will stand still long enough,” he wryly states. An interesting recent project was doing a show for the J. Paul Getty Museum. For that project he made a mold from one of their Renaissance bronzes and then cast 13 bronzes depicting the different stages of “lost wax casting” as it was traditionally cast in that period. David Elder’s documentation took place in 1999. The FOTM Archive contains extensive information about this artist.